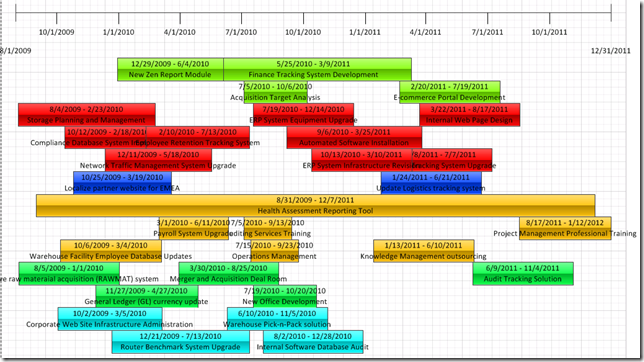 This post represents the third post in a series on creating a multiple timeline portfolio report within Visio. For the previous two posts, please see Part 1 and Part 2. Now that we’ve got this beautiful report, what do we do with it? Well, the obvious answer would be to publish it to SharePoint using Visio Web Services. This not only allows us to surface the data, but it provides an interactive interface so that users may click on projects to review more information in the Shape Data Window. To publish, simply hit File > Save & Send, and select the option to publish to SharePoint as a Web Drawing. Note that one of the limitations (I suspect) of the Visio Web Service is that the data will get refreshed, and the shape data and data graphics will be updated on data refresh, but the x,y coordinates of an object will not get automatically recalculated until the Visio report is actually opened in Visio. Once that’s done, the report will recalculate the locations of the projects, and may then be republished to SharePoint. The report may now be used in a Visio WebPart on a PMO dashboard. The best part, in my opinion, is that users can click on the individual projects and pull up a list of relevant fields directly from Project Server. “Visio services was unable to refresh external data connections in this web drawing because of changes in the structure of an underlying data source. One or more rows in this data source have been deleted after this Web Drawing was last saved. To resolve this issue, restore the deleted rows or update the data connection information in this Web Drawing using Visio”. My data connection is located along with the rest of my data connection files in a SharePoint data connection library, and the connection has been set up to use the Secure Store Service (ProjectServerApplication). The file itself is stored in a trusted location. The file updates fine when using the Visio client. Thanks for reading the post. Glad it’s working in Visio at least. My first thought would be to check something like this posting. It’s possible you ran into some issue with Visio Services, but I would have to test out a couple of scenarios in my own environment to confirm. Note that Visio Services won’t update the X axis anyway, so to properly update this document, I would definitely use Visio anyway. Doesn’t solve your immediate problem, but worth noting. I found that post earlier too, and I have the correct ProviderID in my Trusted Providers. I’ll progress it internally and post if we come back with an answer. Ran into this issue the other day. If it’s not the Secure Store Service, I was able to resolve this by recreating the ODC file. My guess is that I somehow accidentally embedded the ODC file in the Visio report instead of referencing the one I’d posted to SharePoint. Hello, I’ve been able to link ODC data to a timeline view but when I publish changes to a task (of which I have a few as milestones on the timeline) it updates it in the External Data Window but not on the actual milestone itself – either in coordinates or of the date-tag itself. Any thoughts? Sounds like they may not be connected – or you got the wrong fields mapped to the external data fields? If it shows the paper clip link icon thing, I’d suspect the latter. Was anyone able to resolve this issue?